Tradition continues with the our favorite Pork & Sauerkraut meal!!! Steeped in Pennsylania Dutch tradition and traditions added by my grandmother and mom, this meal calls everyone home! It’s 2nd only to the Thanksgiving meal and everyone takes leftovers home! Nothing beats sauerkraut cooked with pork and hotdogs added at the last hour for flavor! Add sausage stuffing, mashed potatoes and dumplings and it’s the perfect meal! Here’s to a Happy 2019 filled with lots of luck! If these hills could talk! So much to see and do in such a short time! Red Rocks Amphitheatre did not disappoint!!! So much music and exercising in one place. Attending a concert here is now on the Bucket List!!! Fun to trek up Dinosaur Ridge, across from Red Rocks to view prehistoric tracks along the ridgeline. Definitely hard to imagine these hills were once flat beaches covered with sandy and water. Fossils and formations are amazing! The history in these hills...if only they could talk!!! It's Fair Time and we love to participate, support and serve The Huntingdon County Fair!!! So much fun to exhibit baked goods, garden harvest and of course some handmade goodness too. This is my 45th year to participate. In those 45 years I've been honored to earn 2 "Big Ribbons"! That all changed during judging on Sunday. When I learned I received 3 - yes, three of those BIG, beautiful rosette ribbons!!! I never imagined it could or would happen. So honored, thrilled and just plain excited. 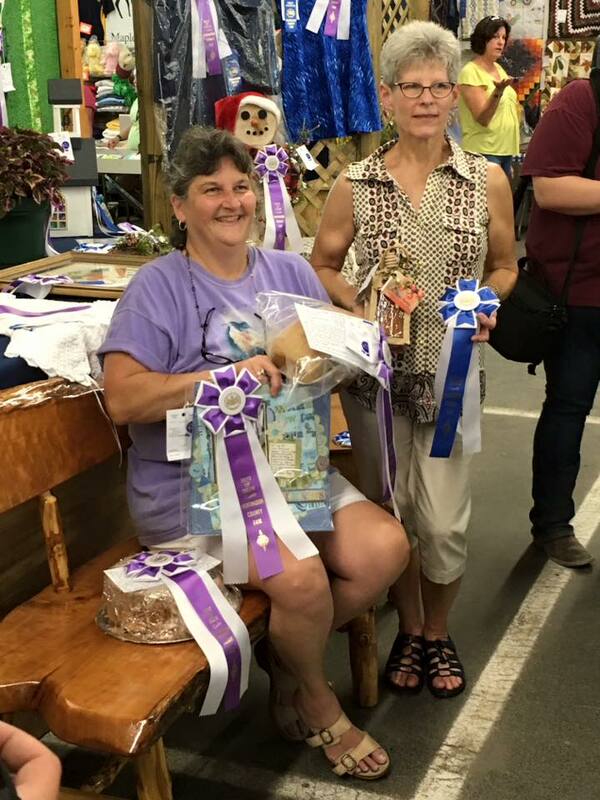 First place and Best of Show in Apiary for my Honey Orange Yeast Bread, First place and Best of Show in Scrapbooking for my Friends layout and First place and Best of Show in Maple Products for my Maple/Hickory/Pecan Chiffon Cake. So excited to be in the company of childhood friends and neighbors! Moral to the story: Participate in your local fair! You'll be surprised with the outcome and it may just put a smile on your face. We enter with no expectations and certainly know that there are others out there far more talented. It's all about family tradition and family fun! A 2nd photo below the title that "could" serve as one of those circular elements...(or not) in addition to the 2 popped elements next to the journaling added right to the background paper. Notice I "made the sketch my own" and used it just as a guide. Most of the same basic elements with some changes, got the page done, a memory recorded and used up some stash! Page #101 complete! A hat to match the sweater! Made from wool, carefully preserved over 70 years, showing some age and imperfection but such a treasure. Now.... before going further, forgive me for the wobbling and out of focus video..doesn't do my Mom justice at all! This was completely unrehearsed & unedited...just like real life & the camera I used, well, I'll not video with it again! Next up, in the coming days...a real live tutorial showing the steps involved in making one of those Weave It Squares! I'm going to work to be like my Nan and not only MAKE the squares but USE them!!!! Wish me luck! I'll be sharing the progress and may even share a Weave It or 2 in my Etsy Shop! Thanks to my Mom who graciously shared her memories with me and to my daughter who humored me by joining us as well. Another treasure to have 3 generations together appreciating the work of a past generation! I have many special people in my life... Many, Many! These 4 though, well, they just might be toward the top of the list. Introducing, left to right, "Nan" (Eleanor) & "Pap" (Merle) and Uncle John & Aunt Myrtie! Just look at those expressions!!!! They really were having fun! The photograph was taken, June 21, 1986, as they gathered at my wedding. Nan and Pap celebrated their 50th Annversary this day too. It was a special day to say the least and a long one...first day of summer...the longest day of the year!!! So much fun and so many memories. I celebrate and remember them everyday, but especially this time of year, an anniversary of a different kind. Today, 19 years ago, Nan (the Weave It Queen you'll learn more about soon) was the first to leave us, Pap followed, then Aunt Myrtie and now, Uncle John, at 99, will follow soon. I am blessed, thankful and fortunate. Trying to Focus and embrace the change! Hope to be back with some bright and cheery Posts soon! as we were getting ready to leave. as if to say..."ah, okay, since you're leaving, go ahead..I'm ready now, take the picture"! Such personality! Enjoyed it immensely! More on this adventure to come! Thanks girls...can't wait for the next one! Stay tuned! It's getting exciting around here!